Yesterday at Beibin Beach, Christian Gospel Mission, Taiwan (CGM, Taiwan) received the new year of 2016 by holding a marathon and beach cleanup event called “RUN,” which gathered college youth to actively participate in loving their land through meaningful social work. CGM’s original idea for “RUN” was to encourage students to adopt the habit of exercising in the morning, elevating the vision of their thoughts, and living a healthy lifestyle both in the body and mind. Under the slight stirrings of the cool ocean breeze, and with their sleeves rolled up and backs bent, university students went along the coastline to pick up garbage. After an hour of beach-cleaning, the amount of garbage collected was an impressive sight. 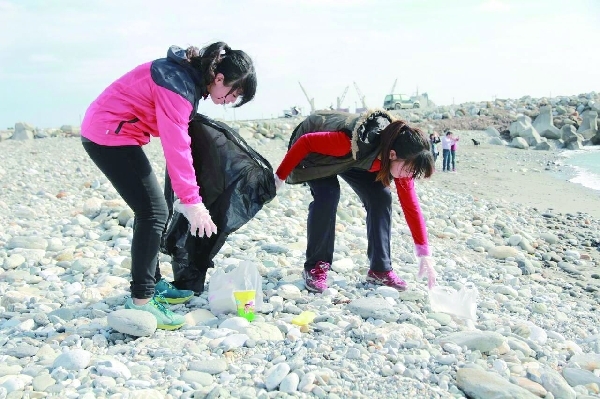 The students on-site responded to the event by encouraging tourists to have public moral for environmental protection and to engage in maintaining the beauty of Hualien. The president of CGM places great importance on the leisure activities and health of youth. So during the New Year’s holidays, (he) prepared, in detail, road running events, beach cleanups, Taroko National Park camping activities and other outdoor activities, to encourage youth to venture outdoors and care about the society. Additionally, he urged youngsters to cultivate a proper and healthy lifestyle by developing a healthy body. In a generation whose “speed replaces depth,” CGM promotes a series of programs such as sports, medical and health, environmental protection, concerts and child and youth care programs in cities throughout Taiwan, in hopes of raising youth to take on Jesus Christ’s attitudes of love and peace. TCGM also seeks to inject a stream of kind, healthy and positive energy by expanding one’s view from an individual perspective to that of a culture and nation.